Please visit this page on my new site: http://www.promisedland-ministries.com/bible-study/shadows-of-the-messiah-where-gods-name-is-written-2/ . In Deuteronomy, when the Israelites were nearing the time of coming into the Promised Land, Moses was instructing them. Many instructions had been given by God in previous books, and Deuteronomy is basically Moses ‘going back over’ these things before the people journeyed forth into the land God gave them. Deut 12:11 Then to the place the Lord your God will choose as a dwelling for his Name—there you are to bring everything I command you: your burnt offerings and sacrifices, your tithes and special gifts, and all the choice possessions you have vowed to the Lord. Deut 12:21 If the place where the Lord your God chooses to put his Name is too far away from you, you may slaughter animals from the herds and flocks the Lord has given you, as I commanded you, and in your own towns you may eat as much of them as you want. Jerusalem was the place to come and offer their gifts and sacrifices. This is where the tabernacle was, (and the temple came to be later) where sacrifices and offerings were made daily. There is great significance to this place. God was known by Abraham, Isaac, and Jacob as El Shaddai. Shaddai means ‘almighty’. To them, God was called the ‘Almighty God’. The photo shows what shin looks like in book type. Just as in English, some of the Hebrew letters look different handwritten than they do in book type. To see a good representation of the letter shin in handwritten form, hold up 3 fingers just like you’re trying to show someone the number 3. This gives a better picture of how it would have been written. 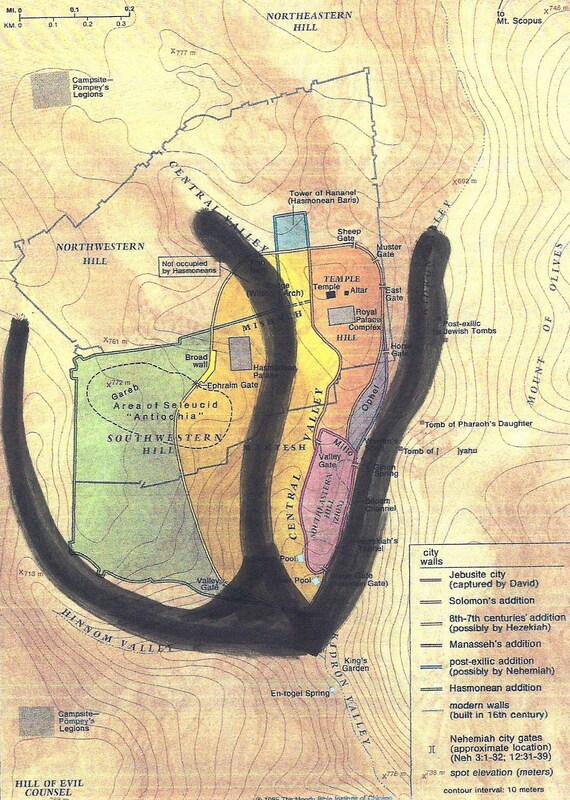 Below is a map of ancient Jerusalem. It shows many areas of Jerusalem as they were added through time. Jerusalem sits on a mountain that is surrounded by taller mountains. 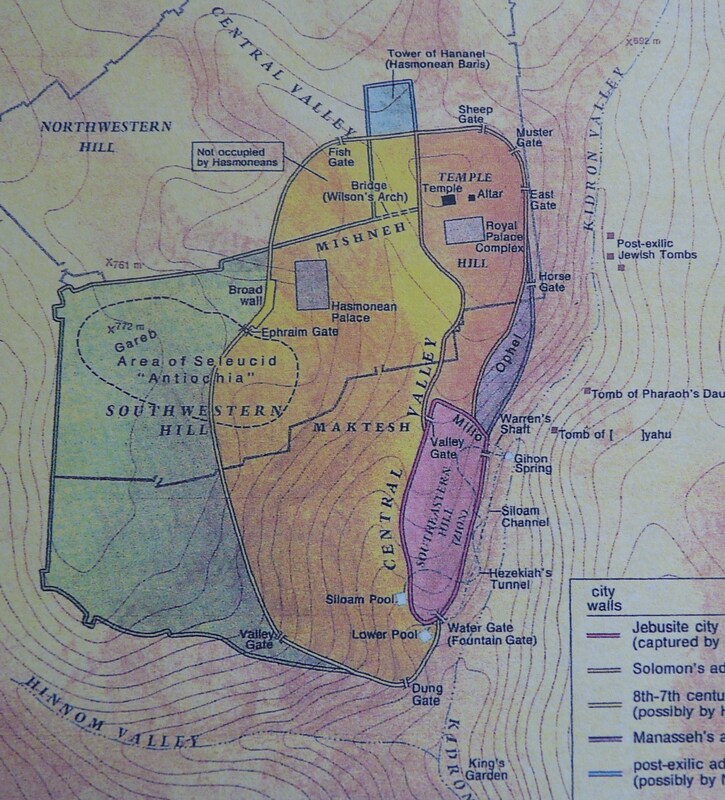 There are three valleys that come together at the base of Mount Moriah. They are the Kidron Valley on the right, the Central Valley in the middle, and the Hinnom Valley on the left. They aren’t easy to see on this one because of the colors on top of the valleys. This is what’s exciting to me. This is the place where God literally chose to write His name! The valleys here form the first letter of Shaddai…God Almighty! Wow……just…….wow!! Amazing!!!!! Bless you and bless his holy name. this was really amazing. God has done so much to cement our confidence in his ways and power. We are probably this only people on earth who can be truly fearless because of the position in Him. What confidence in truth we can all have!!! I have seen this before about the Shin and share with others when possible. I even validated the diagram of the shin in the heart with a Heart Surgeon. When I told him the story about the Shin, he loved it and passed it along to his Bible Study class. This is a great post with one exception, the usage of the word “JEWS” incorrectly. It was the “ISRAELITES” (all 12 tribes) going into the promised land, not just the “JEWS”. The “JEWS” were only one of the 12 tribes. I have read so many great articles and seen many great videos but they lose reaching a vast magnitude of people who the message is also for because of the misuse of the word “JEWS”. Sadly, there is still a stigma when people, including Christian’s, read the word “JEW” or “JEWS” or anything associated with the word. People automatically think the message has nothing to do with them when in fact that is not true in many cases. After God split the Kingdom into, eventually these 10 tribes were scattered to the four corners of the world, becoming the “LOST SHEEP”. We only know of the whereabouts of Judah/Benjamin (known as the Jews) are since the Kingdom was split. I hope the correction from Jews to Israelites in the 2nd paragraph can be made because that is the real fact as to who did cross into the Promised Land. Other than that, GREAT, GREAT article. Thank you…your point is well taken, and the change was made. I appreciate you reading and commenting!! Thank you for the change. I am still sharing this and even today, I am still in awe of our God. Isn’t it funny how the shen looks like an E laying down, the pictograph looks also like an E.
How about the amazing poem by E.E. cummings I carry your heart (i carry it in mine). I think that poeam is divinely inspired from how God feels for us. What a beautiful thought…thanks for sharing Lily! I know this was written over 2 years ago, but I was doing some research on God’s name being written on Israel from a study by Rico Cortes called “Is Islam the beast?” It’s very interesting and led me to look at some satellite photos that prove this very idea! God is so intimate and I am continually amazed at how little we have uncovered. He is soooooooo huge and AWESOME!!!!! Our Redeemer lives and is coming again! Every step I take to know Him more takes me into deeper faith and expectant hope in Yeshua! Thank you for the insight! And thank YOU Melissa, for your very kind comment! I’m always blessed to hear from others that share my fascination with these kinds of study! This is great to see just how personal God is to us and to know how much he thought of us by placeing his name in our hearts. Even the mountains this is so powerful, I could not hardly sleep when I read and saw this on my computer. Thanks for such powerful study and I will share this for the rest of my life. You’re so welcome. Thanks so much for reading! 🙂 God bless you! Excellent connection between the human heart and Jerusalem. To further link these two is the concept of YHWH’s throne. Jerusalem is where His throne is located and the human heart is a picture of His throne in our bodies. Our bodies are a picture of His Temple(Ephesians 2:21-22; 5:30; 1 Corinthians 6:19). His throne = the human heart from whence flows the river of life (blood)…In the book of Revelation (Chapter 4) John is shown a vision of the Throne of Elohim. Around the throne and the 4 living creatures are 24 elders (Revelation 4:4) representing the 24 ribs surrounding the human heart. From the heart blood is pumped to the Lungs. The etymology of the English word ‘Lung’ traces back to the meaning of Light. In our bodies our lungs have 7 vascular bundles called nodes. These represent the 7 Spirits of Elohim (Revelation 4:5; Isaiah 11:1-3). These 7 Spirits/Ruach/Breathe are pictured in the earthly Tabernacle/Temple by the Menorah. littleguyintheeye, thanks so much for your comment! You have now just given me much more food for thought to research on this subject. The human brain seeks out patterns in the world; the shape of clouds, constellations etc.. Not everything has meaning. I would bet that a similar shape of converging valleys could be found, many times over the face of the Earth. I agree with you that not everything someone sees has a scriptural meaning. However, Jerusalem has very special meaning and purpose in the eyes of God. Scripture bears this out time and time again. I know to some this seems like just coincidence, and therefore nothing. However, there is much contained in the world that does have meaning. I am personally not one to grasp at straws in order to say ‘God told me’ this or that. But, I did see something in this that I felt was worth sharing. Although we may not agree on this, I appreciate your comment. If a similar shape is found many times over the face of the earth, that would just confirm what His Word says….He is Lord over ALL THE EARTH!! Hallelujah!! This gives me goosebumps. God is a great God. He sure is! Thanks for reading, and for your comment. God bless you! How interesting and how wonderful! Thank you for sharing your studies with us. What a blessing you are. You’re very welcome! Thanks so much for reading and responding to them. This is the kind of stuff that fascinates me! That was so good, Heather. I never knew our hearts and Jerusalem are stamped with the first letter of His name. Incredible! Thank you, Karin! The Bible is full of so much we don’t know. I so want to find out more. 🙂 God bless you!